Beaver Dam was wet. The pits were wet. The track was wet. Everything was behind because of an abnormally wet summer. But the Outlaws stayed their course and stood guard at the gate while the pits were pumped out and the track crew struggled to get the track ready to race. When the gates opened they took their spots in the pits, covered the floors of their trailers with plastic and readied the horses for what looked to be a muddy, sloppy ride. After surveying the track, there was one that smiled: he liked wet, he liked heavy and when the checkered flags waved, that smile turned to emotion as Craig Dollansky remembered an old friend and mentor. The Outlaws took the track 36 cars strong. They were aiming for an 11.275 second lap around the 1/3 mile high banked clay oval track. It could be done: Daryn Pittman had done it in 2001. But with heavy wet track conditions it was highly unlikely that it would be done again tonight. The engines seem to strain to make the laps with even the most seasoned veterans' cars sounding like they were at the top of the peg but when the smoke cleared it was Jason Sides who came home with Quick Time. Sides turned a lap of 13.115 seconds to collect his first Quick Time of the season. He was followed by James McFadden, Paul McMahan, Cody Darrah and Craig Dollansky. The heat races were a challenge with minimal passing taking place. David Gravel brought home the first heat win with Craig Dollansky, Donny Schatz, Jason Sides and Brian Brown following him into the A Main. Gravel, Dollansky and Sides would transfer to the Dash. The second heat was a tight battle between second and third place cars Kraig Kinser and Tim Kaeding. Kinser beat Kaeding to the line by .004 seconds to take the runner up spot. Daryn Pittman took the win, with James McFadden and Paul Nienhiser rounding out the top five for the A Main. Pittman, Kinser, and McFadden would advance to the Dash. The third heat showed a pattern beginning to form. Cars were able to pass the car in front of them but the slick wet track made it very very difficult to hold the pass. If you could hold the pass it was difficult for an equal car to take the spot back as the turn back was treacherous and hard to control. This would stay true the rest of the night. Joey Saldana took the checkers ahead of Paul McMahan, Steve Kinser, Chad Kemenah and Wayne Modjeski. Saldana and McMahan would go on to the Dash while the others advanced to the A Main. The final heat race of the night went to Kerry Madsen with some help from fate. Todd King, the assigned pole sitter, jumped the start on the initial green and was penalized one row, putting Madsen on the pole. It was a position that he took full advantage of and rocketed to a two-second lead and never looked back. Cody Darrah and Sammy Swindell battled for second with Darrah coming home on top. Also transferring to the A were Jason Solwold and King. The Dash was a quick race with Cody Darrah leading all the way after starting on the pole with an inversion of four drawn. The closest race on the track was for the fourth spot between Australian natives James McFadden and Kerry Madsen. McFadden would beat Madsen to the line by just .009 seconds. The last chance showdown looked more like an IRA (Interstate Racing Association) Sprint race with Bill Balog and Mike Kerscher leading the way from start to finish and crossing the line nose to tail, transferring to the A Main. Jeremy Schulz and Bill Rose also transferred. The A Main was a 40-lap test of wills and patience. With the track being basically two grooves with a somewhat usable middle groove, the slide job pass was a difficult move. The wet track was slick and the final slide in front of the car you were passing was a tricky move: to get the car to grab the track, move forward and not keep sliding, allowing that car to drive back under you. Craig Dollansky is the master of the heavy, wet, slick track, and tonight was no exception. Once Dollansky took the lead on Lap 14, he only lost it for one brief second in traffic to Daryn Pittman. He regained it the following lap and never looked back. The race was marred by only one crash when Sammy Swindell and Kraig Kinser got together sending Swindell on his roof between turns three and four. Swindell landed on his wheels and was uninjured. Both crews made repairs and both drivers returned to the track. For Dollansky, winning the Jim “JB” Boyd memorial was an emotional win. "This is the Jim Boyd Memorial and he was Scott Boyd's father," said Dollansky, who is a long-time friend of the Boyd family. "You know that family supported me for a long time, they owned the team that I raced for 10 years and Jim Boyd was just a great person and an inspiration for me and an awesome individual. He passed away a few years back. He's gone but not forgotten and I know he was riding around with me tonight in spirit." For second-place finisher Daryn Pittman it was a return to normal after a horrible night on Friday. "We were good all night and I always enjoy coming here," said Pittman, a native of Owasso, Okla. "This is one of my favorite race tracks. We put ourselves in position, just maybe needed to time trial a little better and really got up there and had a shot to win, just came up a little short. I think we were good enough to get around him on the bottom if any lapped cars would have held him up at all or if I hit it right. I passed him twice under green flag, once running second and third and once for the lead, but anytime you pass a good car like that you have to take advantage of it." For third-place finisher and Friday night's winner Tim Kaeding, it was a return to days gone by. 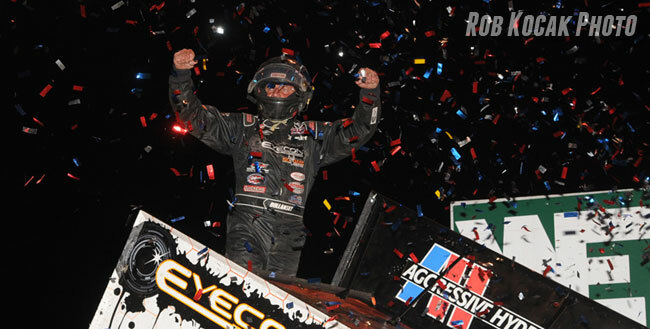 "We worked on the car all night got it way better in the feature, and my motto 'live and die by the high-side' and that's where I went - straight to the top," said Kaeding, of San Jose, Calif. "We had a good car on the bottom too so I could jump around and move around and have a little fun, like crisscross back in the day." Donny Schatz was the KSE Hard Charger of the race, finishing fourth after starting 13th. The night ended on a much better note than it began. The plastic made clean up of the trailers and load in easier. The cars would get baths. The caravan would continue on its journey, this time to a small track in New Richmond, Wisconsin called Cedar Lake Speedway. With any luck and a little sun, it would be a better day. But regardless of what the future holds there is one thing you can count on: if the Outlaws are coming to your town, they will race whether heat and sun baked or mud and high waters.